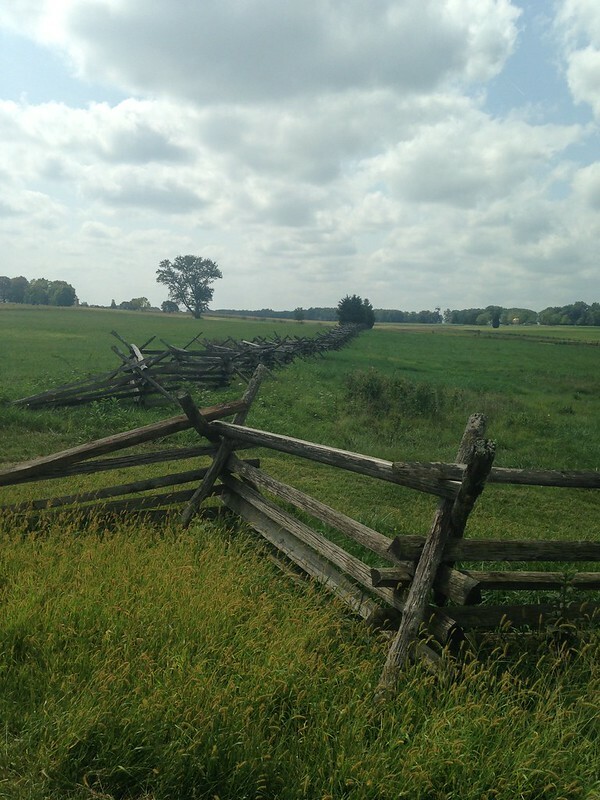 It’s been almost a month since Boyfriend and I decided to take a little long weekend trip to Gettysburg, but I suppose I ought to share some of the photos I took. It was a lovely weekend, with generally nice weather, if a bit warm and sunny some days. I certainly got more sun than usual, even with my sunscreen and parasol at the ready. We left on a Friday evening from work and did not meet much traffic, so we pulled up to the bed and breakfast a bit after 7 p.m. I had phoned ahead to make sure someone would be there to meet us if we were later than 8, and to save us a plate of food so we wouldn’t have to stop for dinner. But because we arrived before the restaurant closed, we were able to sit down to a nice family-style meal, complete with a glass of local wine for me and beer for Boyfriend. It was a lovely beginning to our weekend, and we got to our cottage relaxed and happy. The next morning, we had our breakfast in the kitchen room of the main B&B house. It started with porridge, fruit, and tea, and then continued on with a big plate of cheesy eggs and bacon and toasted homemade bread with strawberry jam. The jam was obviously homemade as well, as it tasted incredibly fresh. I don’t generally prefer strawberry jam, but I enjoyed it very much. From there, we spent the day hiking around the historical park, doing plenty of walking. Although the clouds became rather dramatic at times, we did not get rained upon, although our feet were quite sore. We ended up walking all the way around the north part of the park and back into town, where we got sandwiches for lunch at a little French-themed cafe, and then took the car back to the B&B to rest and clean up before dinner. Dinner was at the historic Farnsworth House, where we ate at the tavern before going on a ghost tour. The tours are given by guides in historical dress, and focus a lot on history, but devote plenty of time to the modern stories of paranormal encounters. I’m not too proud to admit, I felt a few chills while we sat in the haunted attic of the house. Sunday, after a casual breakfast in our room of sticky buns and blueberry muffins, we spend the morning touring the various wineries and cideries in the area. 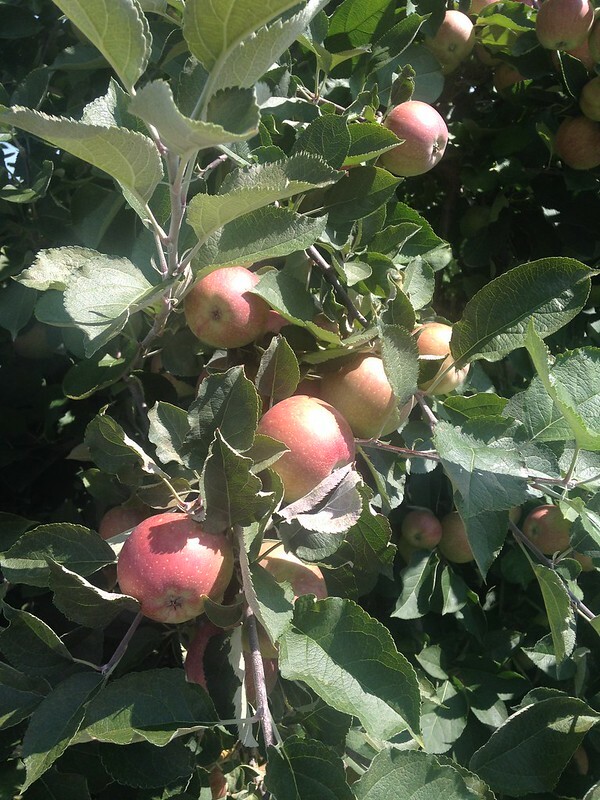 The countryside was stunning, particularly with the trees so laden with ripening apples. We bought plenty of wine and some cider to tide us over until we can get this year’s batch fermenting. From there, we went back into town, where we had lunch at an Irish pub. It was rather upscale pub food, and I enjoyed my Scotch egg, fish and chips, and Murphy’s with relish. I was excited to see they offered “a wee bit of fish and chips” and 10 oz. beers for those of us with smaller appetites. Duly fortified, we ventured back into the historical park to walk around the south part of the park. Sadly, the hiking trails are far less well maintained, with the most care taken to keep up the newly paved driving tour route, so we spent much of our time walking along the road instead of braving the somewhat deserted trails. I found it sad that the roads so greatly reduced the number of walkers on the trails, with people preferring to drive up to the landmarks, get out of their cars for a few minutes, and then get back in and continue driving. But we enjoyed our walk, and I got a lovely panoramic view from the observation tower. Two days of so much walking and sunshine left us ready to head out on Monday after breakfast on the deck of the main B&B house. But it was a lovely weekend!